If you’re already brushing and flossing daily and going in to see your dentist twice a year, then you’re taking pretty good care of your oral hygiene. But are you changing your toothbrush often enough? Because the point of brushing your teeth is to clear out the plaque and bacteria that build up in there, a lot of that bacteria ends up on your toothbrush. That’s why it’s important to thoroughly wash your toothbrush after each use. It’s not enough to just rinse off the excess toothpaste. You have to wash the toothbrush with hot water to make sure you also rid it of any germs that may be lurking between the bristles. But never put your toothbrush in the microwave or dishwasher, as that could damage the toothbrush and make it less effective. Making sure you’re properly storing your toothbrush is also important. Don’t keep it near other toothbrushes, as that creates the potential for bacteria to be transferred from one brush to another. That’s the same reason why it’s also important to make sure you’re not sharing toothbrushes with anyone, especially if either one of you has been sick recently. Even if you’re both healthy, introducing their bacteria to your mouth (and vice versa) can lead to disease and infection as the new bacteria try to take over your mouth. Don’t keep it near the toilet, because toilets spray bacteria into the air with each flush. Finally, don’t keep it in an airtight travel container, near the shower, or in any other damp place, as that will create an environment that promotes the growth of bacteria. Assuming you’re doing all that right, and you’re healthy, you should be replacing your toothbrush every three months. If you’ve been sick, you need to replace your toothbrush as soon as you start feeling better/after you’ve finished receiving treatment. If you have chronic conditions, especially those that involve the mouth or throat (such as cold sores), replace your toothbrush after every flare up. 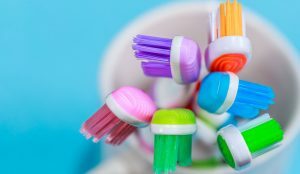 Viruses can linger on inanimate objects for days, or even weeks, so it’s important to throw out your contaminated toothbrush as soon as you start to recover. Diabetes is another chronic illness with a high risk of tooth decay, so those with diabetes need to replace their toothbrushes more often than the standard three to four months. Depending on how advanced the disease is, diabetic patients may need to replace their toothbrushes as often as every three to four weeks. When in doubt, check the bristles on your toothbrush. If they’ve started to fray or look worn down, they’re not going to clean your teeth as effectively and you’ll need to get a new toothbrush. Regularly changing your toothbrush is an important component of maintaining your oral health. The dentist might help you out by providing you with a free brush after each appointment, but that’s not enough, even if you’re seeing your dentist every six months. You also need to be replacing your toothbrush halfway between appointments to make sure your toothbrush is clean and the bristles are stiff and effective.